Agricultural Production is within the Agriculture & Agriculture Operations field of study. 1,005 Agricultural Production students graduate each year from Agriculture & Agriculture Operations programs. In the U. S., Agricultural Production is the 170th most popular college major. 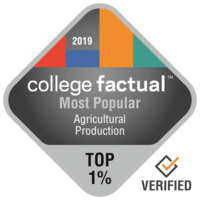 Look over the ranking breakdown for more info about the selection of the most popular Agricultural Production colleges. University of Wyoming is a wonderful choice for individuals interested in an Agricultural Production major. Laramie, Wyoming delivers a charming small-town feeling for young people to learn in. Roughly 98.1% of the teachers at University of Wyoming are full-time and get normal office hours, so they should be more accessible to students. Only 5.0% of University of Wyoming graduates are in student loan default. That's striking, when the national average is 7.0%. Go on a virtual tour to know more about U of Wyoming.